What should we bring to the Summit on the 28th? JUST YOUR TICKETS and only your essentials (can it fit in your pocket?). Students do not need to bring their backpacks. Every attendee will go through security and the less items you have, the quicker you can get inside. *Please note that there is a clear bag policy that is enforced and it is noted on the tickets. A purse or handbag is ok if it’s not bigger than 4.5”x6.5” (basically no larger than your average hand). 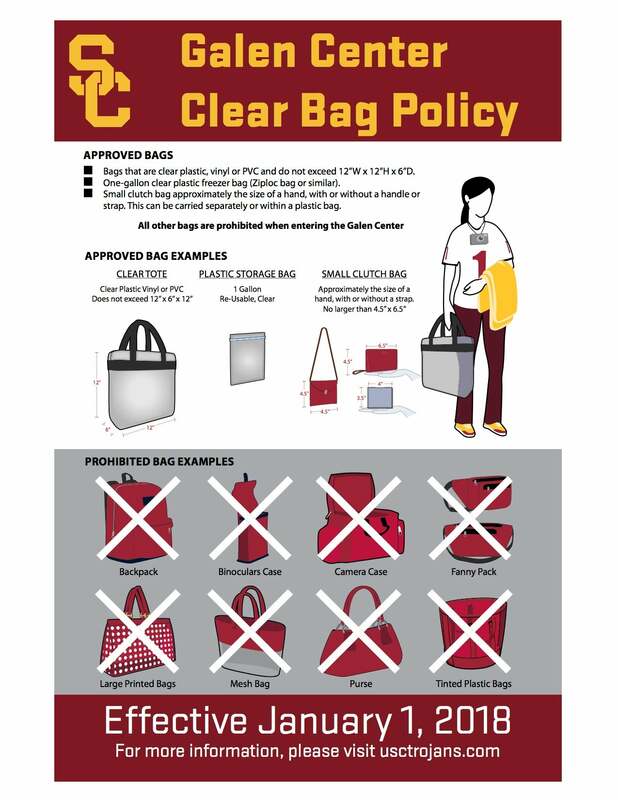 Click here to learn more about the clear bag policy. We heard the tickets are going to be sent to us? What does that mean? You will need to print these tickets before the event and give one to EVERY person you are bringing to the Summit - including chaperones. Every person will need a ticket in hand before being able to enter the Galen Center. We are not bringing as many people as we originally said. What should we do with the extra tickets? Please print out any unused tickets and drop them off at Will Call We have a waiting list and don't want seats unfilled. If you know which tickets you are not using before September 27th, please email us at girlsbuildla@lapromisefund.org. ​Do we need Media Release forms? There will be press and media during the event. We recommend that you get students to fill out media release forms (we have them in English and Spanish) and keep them internally. We are working with LAUSD Transportation to secure buses for your school. We will provide you with the bus information, pick-up, and drop-off time so you can process all the field trip paperwork necessary for this trip. Please click here to check your bus confirmation number. If your school is not on this list, it means that you have opted out of registering for an LAUSD bus. Please provide an invoice with your school's letterhead, the original bus invoice, and W9 to girlsbuildla@lapromisefund.org by October 31, 2018. Please provide the original bus invoice, the bus company's certificate of insurance, and W9 to girlsbuildla@lapromisefund.org by October 31, 2018. *** Schools will be provided a specific drop-off area at the Galen Center. Please stay tuned for updates. If you are bringing less than 40 people, we recommend taking Metro or setting up a carpool for private rides. We will also reimburse for public transportation and parking. Please save your receipts and email a copy to girlsbuildla@lapromisefund.org by October 31, 2018. Where can our bus drop us off? ​Please click here to see where your bus needs to drop you off, and here to see the map. Will there be free t-shirts? Yes! We will be giving away t-shirts to everyone who attends. To expedite this process please come ready with a list of how many shirts you want and each size. Use this form to get organized. No, there is no dress code but we do recommend wearing school shirts or putting on the shirts you pick up at the start of the Summit. What do we need to bring to pre-register to vote? Students 16 years of age and older can pre-register to vote at the event. They just need to bring a state ID OR the last 4 digits of their social security number. ​Want to learn more about hosting an event? Check out this slide deck. We want to learn more about how to take action with voter registration and civic engagement. What can we do? 1. Check out our Action Center via Countable and learn different ways to stay informed. 2. Click ‘Step 3’ to record your video to tell us how you plan to take action this November. 3. Activate your network by sharing your video and the Girls Build Action Center link. Want to be featured on the screens at the Girls Build Summit? Yes, we encourage you to bring everyone. The Galen Center has wheelchair access and we can optimize for all students to enjoy the day. Will there be Spanish translation? No, the entire program is in English. We recommend bringing your own headsets to conduct your own translation for your students. Will there be ASL translators? No, we recommend bringing along your own ASL translators for your students. If you are bringing ASL translators please let us know so we can seat your group in a location that will best accommodate the translation. What schools can sign up to the Summit? Any public high school in Los Angeles County can sign up. Schools can bring up to 150 people total for a maximum of 3 buses- this includes students, teachers, and chaperones. So please be mindful and make sure to collaborate with your colleagues to avoid duplicate registrations from your school. How do I know if my school is going? Will I get a confirmation? You will be notified via email if your school has been confirmed. Note that space is limited, so register early and be sure to check your inbox often for communication. Which students can we bring? This event is for high school students who identify as female only. Chaperones can be male or female. No. This event is for girls only - any student that identifies as female is welcome to attend. We are an LAUSD school, are we pre-approved? If you are LAUSD, you still need to go to your local districts to inform them you are attending - but this field trip and field trip location are pre-approved at the central level and you should be cleared. This is an early dismissal day for my school, can we still attend? Yes, you can still attend the day, but you will have to work out logistics to get students home. You will not be able to leave the event earlier than 1pm. Will there be a vegan option for lunch? The lunch options will be turkey or vegetarian sandwiches. We will not be able to offer a purely vegan option. We recommend that students who are vegan or have specific gluten or wheat allergies bring their own food for the day. No, you do not have to be a Girls Build team to attend this event. But we hope you apply!